Recently, I have been contacted by Matt Zajechowski about “an interactive graphic/map that [he] helped develop with Olivet Nazarene University that covers the second most spoken languages around the world”. This interactive map (or rather a set of maps for each continent) can be seen here; clicking on each country displays a sidebar that shows its official language(s) and second most-spoken language(s). Countries whose second most-spoken language is English are shown in purple. The sources for the data can been seen underneath the map. According to Zajechowski, the creators of this map “excluded any official languages from being the second most spoken language and noted them as official languages for each country to avoid any confusion”. Yet, considerable confusion remains, primarily as regards the issue of what “most-spoken language” means: the speakers’ mother tongue (L1) or their second/foreign language (L2). When I asked Zajechowski about this, his responses essentially reiterated the description above. A closer examination of the map reveals that there is no clear answer: in some cases it is second most commonly spoken L1 that is being mapped and in other cases, it is the second most commonly spoken L2. Note also that the “Official language” listed for the U.S. is English. 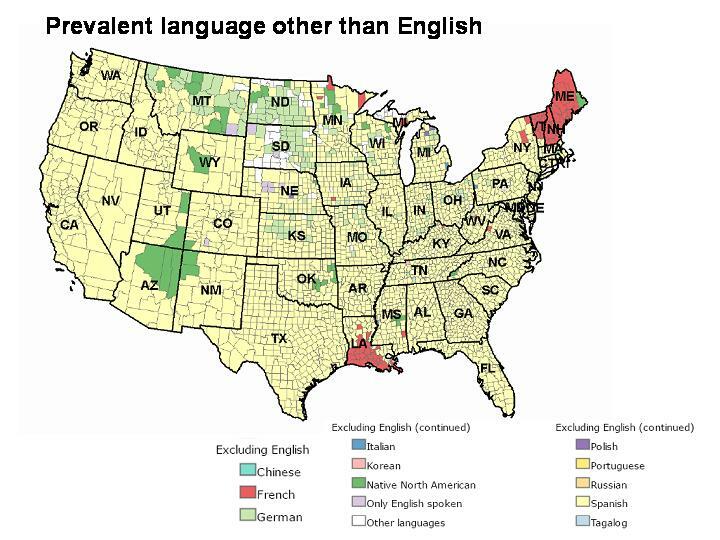 What remains unsaid is that the legal status of English in the U.S. is different from, say, that of French in France or Russian in the Russian Federation, which are listed as the official languages in the country’s constitutions. The special status of English as “an official language” is not legally recognized. Similarly, in Canada, English and French are listed as official languages, and “the second most-spoken language” listed is “Chinese languages (Cantonese, Mandarin, and/or other dialects)”. Notable is the unwarranted treatment of Mandarin, Cantonese etc. as dialects rather than distinct, mutually-incomprehensible languages—an error that is, unfortunately, made all too often in non-linguistic discourse. Nonetheless, it appears that what is being mapped here is the most commonly spoken L1s. Curiously, much more similar linguistic varieties than Mandarin and Cantonese, such as Serbian and Montenegrin, are considered by map authors to be distinct languages: for instance, in Montenegro the official language is listed as Montenegrin and the second most-spoken language as Serbian. Thus, what is being mapped is geopolitical boundaries rather than the actual linguistic situation on the ground. Interestingly, the Ethnologue listing for Montenegro does not include Serbian at all, and Bosnian, with 36,700 speakers, is listed as the country’s second most commonly spoken language, after Montenegrin (Albanian with 32,700 speakers is a close-third). However, the lack of Serbian in Montenegro’s Ethnologue listing may be an error, as the Wikipedia article on Montenegro lists Serbian as the most commonly spoken language in the country (according to the same 2011 census), ahead of Montenegrin by almost 40,000 speakers. If those numbers are correct, however, Serbian does not qualify as Montenegro’s second most-spoken language; Montenegrin is out of the running because of its official status, so Bosnian once again emerges as the “second most-spoken language” in Montenegro. German plays a prominent role as an L1 in France, where about 1.5 million speak it as a mother tongue (in the Ethnologue listing for France, it is listed as “Alsatian”). Italian—as L1—trails with 1 million speakers, Portuguese has about 750,000 speakers, and Spanish counts under 500,000 native speakers. Breton has about 206,000 speakers in France, Occitan and Catalan have about 100,000 speakers each, Basque has about 76,000 speakers, and Corsican, Luxembourgish, and Romani have even smaller numbers of native speakers in France. But when it comes to its use as an L2, German is not the most prominent language in France: according to Jakub Marian’s numbers, only 6% of Frenchmen can hold a conversation in German, while nearly 40% can do so in English. Thus, so far it appears that the interactive map represents second most-spoken mother tongues. But let’s now consider the Russian Federation. Here the official language is listed (correctly!) 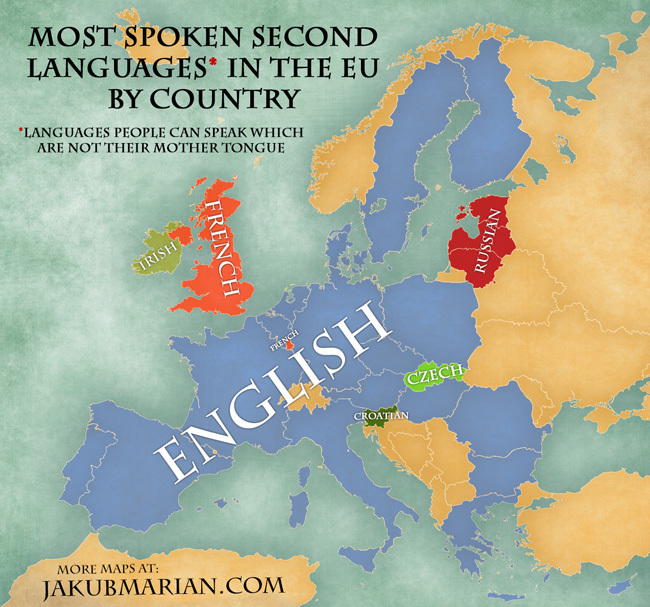 as Russian and the “second most-spoken language” is… English. The sidebar explains: “English is the most common second language, spoken by 78% of all foreign language speakers in Russia, or roughly 11.7% of the population.” Contrary to the conclusion drawn above, what is being mapped here is clearly the second most-spoken foreign language, or L2. (The number of native speakers of English living in Russia is negligible.) The second most-spoken L2 rather than L1 is also mapped for several other countries, for example, Libya. Here, Arabic is listed as the official language and second most-spoken language is again English: “English is commonly understood among the educated classes, and in major cities”. The Ethnologue listing for Libya does not list English among its speakers’ mother tongues. From the above discussion, one might suppose that what is being mapped is the country’s second most-spoken L1 or second most-spoken L2—whichever happens to have a larger number of speakers. Such a map would be unnecessarily confusing and, frankly, not very helpful. Imagine that a map claiming to represent the most popular hair color (or second most popular hair color, for that matter) showed the most popular natural hair color for some countries and the most popular dyed hair color for others—without indicating clearly which is being mapped in which case. Obviously, such a map would be plenty misleading and not very useful to anyone. A map of the countries’ most common natural hair color might be used to visualize phenotypical realizations of a certain genetic trait (or traits), as does the map found here. A map of the countries’ most popular dyed hair color might be of use for hair stylists or cosmetics companies marketing hair treatments. A mix of “apples and oranges” tells us… nothing useful. But unfortunately the interactive map in question is not even the useless map I described above because in some cases what is being mapped is not the second most-spoken language, whether it happens to be a popular L1 or L2, but rather some arbitrarily selected language that is not all that commonly spoken at all. Consider, for example, how Sweden and Finland are being mapped. The official languages are stated correctly as Swedish in Sweden and both Swedish and Finnish in Finland. 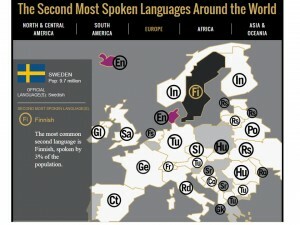 As for second most-spoken languages, for Sweden it is Finnish that is listed. 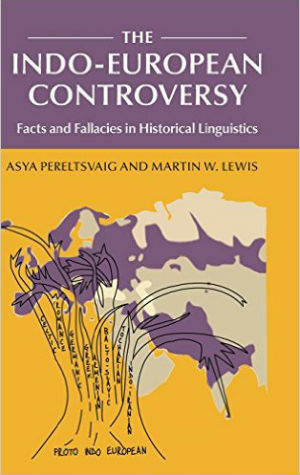 The sidebar reads: “The most common second language is Finnish, spoken by 3% of the population”—which accords well with the figures listed in the Ethnologue: about 200,000 speakers of Finnish from the overall population of 9.6 million. When it comes to Finland, the second most-spoken language listed is “Indegenous” [sic]; according to the sidebar, “the most common second language is Sami, an indigenous language closely related to Finnish, spoken by .2% of the population”. If we limit ourselves to most commonly spoken mother tongues (L1s), the second most-spoken language in Finland is actually Swedish: according to the Ethnologue, there are 271,000 native speakers of Swedish in Finland (there are also 2,390,000 L2-speakers of Swedish in Finland, or 44% of the country’s population, which also makes it one of the most popular L2s). 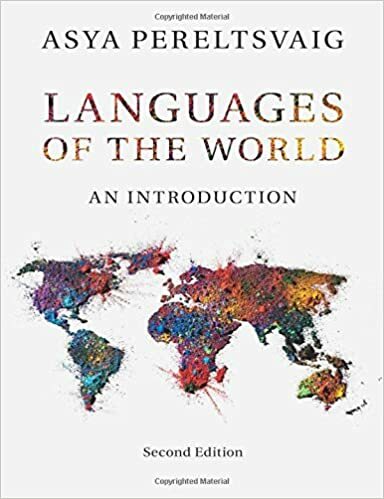 However, according to the rules that the map’s authors set for themselves, official languages are excluded from consideration when it comes to “second most-spoken languages”. Thus, Swedish in Finland is out, but what is the next most widely-spoken L1? As it turns out, it is not Saami, as the map’s authors claim. There are only 2,300 speakers of different varieties of Saami across the country. (In fact, one of the smaller Saami varieties, Inari Saami, is a statutory provincial language in Sodankyla in Lapland, so it may count as “an official language”, depending on how one defines this concept, something that the creators of this map are rather vague on, as mentioned above.) Several other languages have larger native populations in Finland: Estonian with 33,100 speakers in Finland, Tornedalen Finnish with 30,000 speakers (if one cares to distinguish it from Standard Finnish), Karelian with 10,000 speakers, Romani with 10,000 speakers, and Livvi with 5,170 speakers. It is thus completely mysterious why the title of “second most-spoken language (that does not happen to be an official language)” went to Saami rather than Estonian. Even more enigmatic is the choice to map the second most-spoken L1s in the case of Sweden or Finland but not in Russia, as noted above. One could explain the choice of English for the Russian Federation by the fact that there are more L2 speakers of English in Russia than there are L1 speakers of the country’s second most-spoken L1, Tatar. 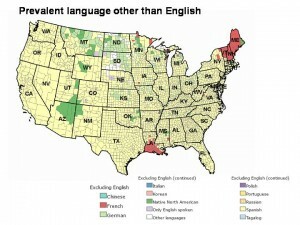 The latter is spoken natively by about 5.3 million people (and the number of its L2 speakers is negligible), which amounts to about 4% of the total population whereas English is spoken (non-natively) by almost three times as many people. But according to this logic, Sweden and Finland should be both mapped as having English as their “second most-spoken language” because it happens to be a very popular L2 in both countries, as shown for example by the map produced by Jakub Marian. 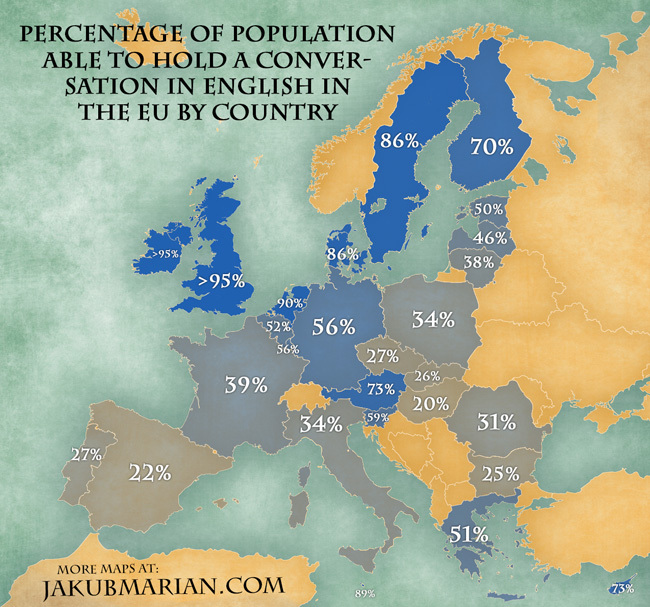 According to another one of his maps, 86% of Swedes and 70% of Finns are “able to hold a conversation in English”, among the highest figures in the EU. In absolute numbers, it amounts to approximately 8.4 million Swedish citizens and some 3.8 million Finnish citizens. Clearly, English is a far more commonly spoken language (albeit mostly non-natively) than Finnish in Sweden or Saami in Finland. Finally, I shall note that based on my own personal experience, many of those who study English as a foreign language in Russia (which is the number cited by the interactive map’s authors) cannot actually hold a conversation in the language. This only makes the decision to map English as a second most-common language in Russia but not in Sweden or Finland even more bizarre. If one travels to these countries, one would quickly realize that this mapping does not accord well with reality. All in all, I find this map—all its interactive graphics aside—perplexing and confusing rather than informative or instructive.